Wargame News and Terrain: Hexy Models: Hard City Miniature Boardgame Kickstarter - Retail Pledge, Reviews and The Story of Hard City! Hexy Models: Hard City Miniature Boardgame Kickstarter - Retail Pledge, Reviews and The Story of Hard City! Hexy Models' Hard City Miniature Boardgame Kickstarter has been funded for well over 160% of its initial funding goal. 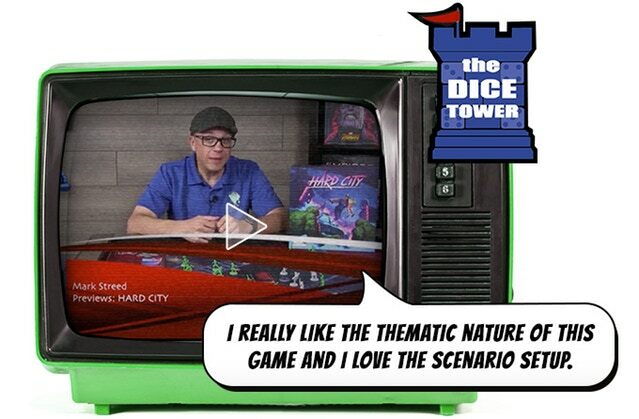 Hexy Models now also released a retailler pledge along with a The Dice Tower review and more information about Hard City! First 48h Report: FAQ, The Dice Tower preview, info for retailers and more story on the page! Hello Rectruits, enjoying your weekend? We certainly are. Our campaign is at 160% on its third day and we have some exciting announcements to share with you! First of all, we created the campaign's FAQ. If you are a new backer looking for some specific information and you do not want to dig through over 100 comments, look here first. Maybe we had already answered your question before you asked it! Secondly, if you are a game store owner wishing to support Hard City, we have a special offer for you. Just email us about the details. Another Hard City video was also published today. Mark Streed from the mighty Dice Tower had a look at the prototype of our game and totally loved it! Last but not least - the story. Hard City is a heavily thematic game with an immersive story divided into Episodes, cutscenes, pop cultural references, Easter eggs, etc. We feel as if we have presented too little of that so far. You know that there is Doctor Zero, the Officers, the mutants, but what is actually the background for the events presented in the game? How did it all begin? Check out the bottom of About the Game section. Have fun reading! PS. Have you already joined our official Facebook group, Hard City Player Department?